Today we woke up and grabbed breakfast, then headed to chapel, which will be our schedule daily. The chapel is so fun. The ABC students all get on stage and sing and dance for us. It’s amazing because they can actually move, unlike us white Americans. And Tiger, who’s not white, but still can’t dance. Then, ABC’s main Pastor, Blessings preached and seriously, he is the Malawian version of Pastor Erwin. He has a little baby girl and wife, Fales- they moved to Arizona for two years so Blessings could go to ministry school. They’re incredible and brave souls. I asked Fales how she liked America, and she told me that we have too many options. She said she’d go to a grocery store and panic because there were dozens of the same type of product to choose from! Ah, good old America! 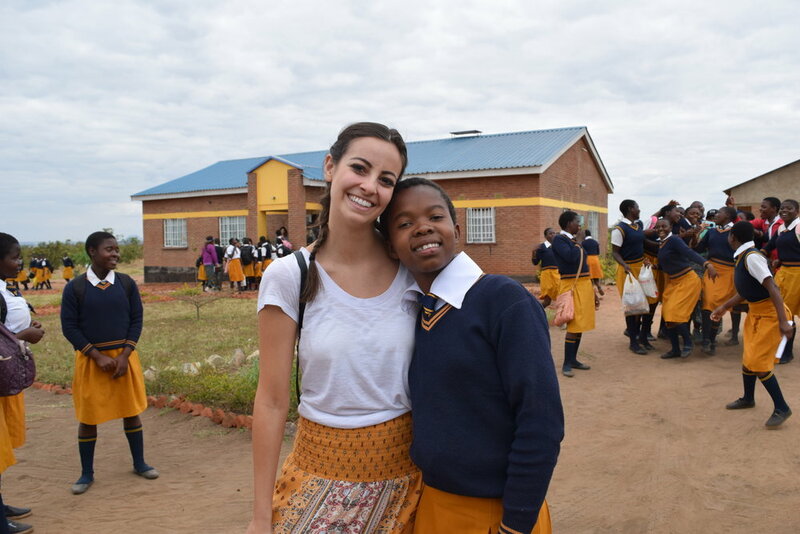 After chapel we bussed to Girls Shine, a high school for girls in the area that’s always growing. Last year, there were 120 girls and now there’s over 200. We arrived again to a flood of young girls running alongside our bus. They greeted us with signs and then we wasted no time in joining the chiefs for an assembly, much like the one we saw at Mkanda yesterday. Apparently this is a thing. The girls sang, danced and told us all about what their daily lives are like. At one point they were showing us the food they eat and obviously, Americans can’t eat all the food here because of health reasons, just different bacterias than we’re used to, but it’s considered very offensive to not eat the food when it’s offered so when the girls invited us to try it, we of course obliged. Won’t lie, I was rather skeptical so I didn’t eat a ton, but I did have some sema, which is ground up maize and clearly it didn’t kill me. Then, the girls started a dance circle and wow, like the ABC students, they can MOVE. I was shy at first, but eventually joined in and am so happy I got out of my own way, because it was a blast. The girls kept trying to teach me how to shake my hips like them, which was hilarious because... I just can’t. I may have the spiciest personality ever, but my dance moves are seriously lacking in any such flavor. The whole thing was so much fun. We also presented the girls with a skit of our own to teach them about America. We broke up into groups based on the different regions of America and did a little rap to explain what each area is like. Ours was (and yes it pains me to write this because it’s so white and so lame), “We’re from the middle of the USA, we have 4 seasons and grow lots of maize. We play American football, it’s kind of a craze!” Again, super white. But also hilarious in the most embarrassing way possible. Once the assembly, which was a solid 2 hours long, was over, we broke up into groups to teach the girls different lessons we prepared. My lesson was storytelling and Courtney was my co-leader. I adore Court and am just so lucky she was with me this first day. When I first met her I thought to myself, “I am not going to get along with this girl.” She’s very type A and that can come off as bossy or know-it-all. But now that I actually know her, I see it’s because she’s so intelligent and because she cares so much about this mission that she wants it all to go as smoothly as possible. She led the show during the lesson, which was great because I was weirdly nervous and jittery. I think the language barrier is what’s throwing me off. I keep forgetting to pause and let the translator help. So, having Court, who’s been here before, helped me break through all that. We read the girls our verse for the trip, Matthew 5:14-16 and had them write a poem/song/story etc about how they share their light. The highlight was when a group of little girls found out I was a journalist and got all excited because that’s what they want to grow up to be. They asked me how they too could become journalists and I told them to start interviewing everyone they could in their village. So, one little girl named Miracle apparently went up to Pastor Kim after and interviewed her. I didn't’ see it, but Court told me about it later and I was in tears. THIS is why we’re here- to show these girls, who are taught that all they’re meant to do is get married and have kids- that they can actually do and be ANYTHING they want. They are powerful! It was an emotional day that only made me fall more in love with Christ and Malawi.